The historic Martha’s Vineyard island town of Oak Bluffs is the setting for Farm Neck Golf Cub. The club is set amidst Farm Neck Estates, a neighborhood of wonderfully situated residences that borders a beloved Vineyard golf course favored by U.S. presidents and traveling golfers of all skill levels. 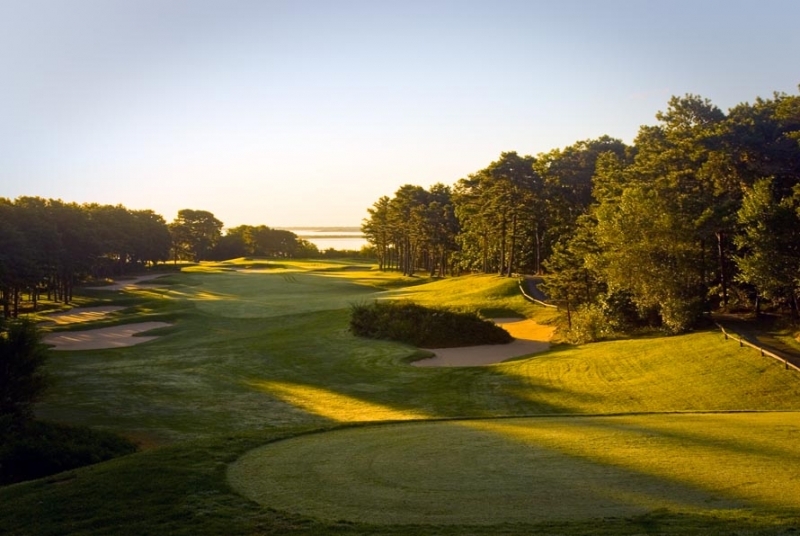 Designed by the dean of New England golf course architects, Geoffrey Cornish, the championship course at Farm Neck Golf Club may be most famous for hosting both President Barack Obama and President Bill Clinton. Send me more information about Farm Neck! Enjoy Nantucket Sound & Sengekontacket water views. The Farm Neck Golf Club community—the golf course and adjoining cluster of homes—rests on a peninsula of rolling farmland on the eastern side of the island, overlooking Sengekontacket Pond and Nantucket Sound beyond. With a postcard beauty but plenty of shotmaking challenge, this mature and lushly maintained course stirs the golfing soul with numerous views of the ocean, pond and island beaches. It has a complete pro shop, upscale rental equipment and a driving range. Send me more information about Farm Neck! Sample home which overlooks the Farm Neck golf course. Real estate at Farm Neck Estates features elegant single-family homes priced from $2.3 million to $4.5 million. For more information, see the real estate section below. Send me more information about Farm Neck! Elegant homes overlook the golf course, Sengekontacket Pond and Nantucket Sound. Send me more information about Farm Neck! Tennis at Farm Neck is nearly as popular as golf. The club has four outdoor Har-Tru courts and an active program of lessons, clinics and tournaments for adults and juniors, conducted by skilled and helpful teaching professionals. And overlooking the first tee, the Farm Neck Café offers casual dining from April through November. In addition, the Café is available for private parties, receptions and weddings either indoors or under the Farm Neck Tent. Presidents Obama and Clinton rank the course a favorite. This special island property is part of a decades-old effort to preserve and protect 500 acres of land along the shores of Sengekontacket Pond from over-development. The result, both as a recreational and residential asset, has been judged a glowing success. The Farm Neck Foundation is funded by annual donations from Farm Neck members, friends and admirers. Since its formation, the Foundation has made grants to Islanders in need—more than $600,000 donated to preserve, protect and promote a precious way of life. Send me more information about Farm Neck!